The RNeasy Mini Kit provides fast purification of high-quality RNA from cells, tissues, and yeast using silica-membrane RNeasy spin columns with a binding capacity of 100 μg RNA. Tissue samples can be conveniently stabilized using RNAlater RNA Stabilization Reagent or Allprotect Tissue Reagent, and efficiently disrupted using a TissueRuptor or TissueLyser system. RNA purification using the RNeasy Mini Kit can be fully automated on the QIAcube. 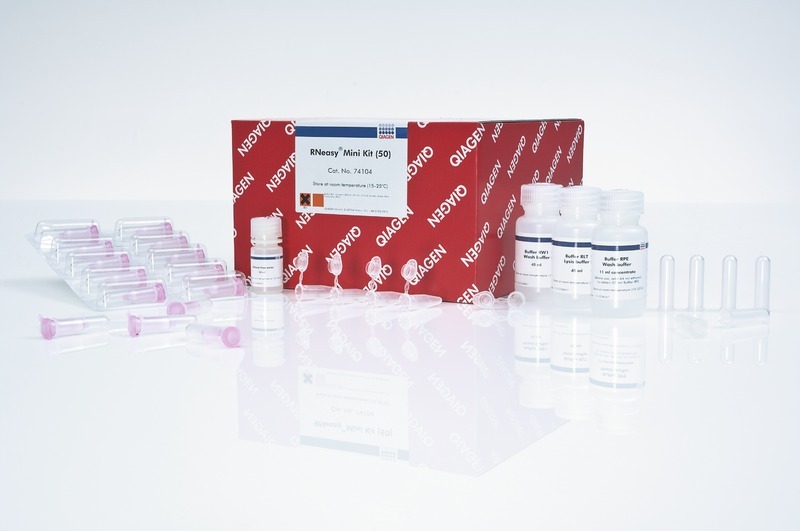 For smaller and larger samples, the RNeasy Micro Kit (spin-column binding capacity of up to 45 µg RNA), the RNeasy Midi Kit (spin-column binding capacity of 1 mg RNA), and RNeasy Maxi Kit (spin-column binding capacity of 6 mg RNA) are also available.